I have very mixed emotions over this performance and result; they’re going to take a bit of processing. Although my official prediction was for the home side to win by three, I still wasn’t of a mind where I could now say “I’d have been happy with the losing bonus point were it offered before kickoff”. I really thought we went into this with a good chance of winning, and as the match played itself out it looked more a case of our letting them beat us rather than being actually overcome by a much better side. So I guess the only way to harp on this fixture properly is to break it up into four quarters, try to unpack what happened during each period, and see where it leaves us. First, while I did my best to pay my respects to Axel in last week’s writeup, I can’t let the moving events of the weekend go unmentioned...of course there was that extraordinary occasion at Thomond Park, the excellent rendition of Field of Athenry at the Kingspan, and from Leinster the classy touch of the players wearing red jerseys with AF and 8 before kickoff. Awesome to see the rugby family pay fitting tributes to such a stalwart of the game. Back to the rugby...Jake White has moulded this Montpellier squad into something of a classic South African outfit, ie a host of man mountains looking to tackle you into the middle of next week so they can gather the scraps for easy scores. And they showed that very physicality every time we had the ball from the start. Many of our attacks were halted by tackles behind the gainline and hurried attempts to ship the ball on, though the dreadful conditions both above (rain) and below (choppy pitch) were a factor as well. Yet here’s the thing...particularly in those early stages, we were halting their progress as well. Once our defence was set (a key component as it turned out), there was no way they were going to get through us and their best hope was to ship it as quickly as possible to the wider channels and hope our narrowness would cost us but in that opening spell we were able to recover even then. So as the clock neared the 20 minute mark, we were definitely well set at 0-0, and when Francois Steyn’s first goal attempt hit the upright falling for a 22 drop out, we dodged something of a bullet before embarking on an impressive march up the field ourselves to open the scoring. It started with the drop out taken short by Sexton, often a risky move but not so much with an accurate kick and Dev Toner on your side. Just like that possession was won back and we moved our way up the park a bit before putting a high ball into the Montpellier half. Ouedraogo took it easily enough but the kick support was there to halt his side’s progress and eventually it was great to see Sean O’Brien back getting himself involved in winning penalties at the breakdown again. This gave us a chance to take the lead and it was interesting to see Isa Nacewa stepping up given Sexton was on the pitch. Looking back over the first half you can actually tell from his general kicking that he was holding something back, probably for fear of further damage to his hamstring, Perhaps you could argue that a semi-fit Sexton is better than no Sexton but the way his involvement panned out it really did look like a risk was taken. Anyway Isa was able to slot the ball over and we were in front, and at that stage relatively comfortable. Many times in the past we have had our hopes dashed in France by a quick two-try salvo but at the 25 minute mark, it didn’t seem too likely here. But then I had to raise an eyebrow as Devin Toner was penalised for interfering with a lifter at the lineout. Not because it was a questionable call, mind you...rather I wondered why we would even consider going after their throws. Better to keep all our feet on the ground and get set for more of an onslaught, I would have thought. At first we were lucky in that Steyn missed his touch from the penalty for what would not be the last time on the day. And while the home side came back at us after our clearance, there was Sean O’Brien again burrowing his way into the breakdown and pinching the ball back for us. It looked like yet another attack had been thwarted and would have served to frustrate the home side AND crowd even further. Of course it’s easy for me to say now that Cian Healy shouldn’t have picked up the ball from the base at that stage and run forward. It was a positive idea and in general it should be encouraged. Unfortunately for both him and Leinster, he was unable to hold it in the tackle so as we were switching our focus from D to attack, all of a sudden we were forced to switch back again. Luke McGrath got a good tackle in on Jannie du Plessis forcing the ball free again only it went sideways where it was gratefully gathered by Vincent Martin. When he looked up, our defence was a long, long way from set and he knew full well this was a good opportunity to strike. This most certainly was not to be Jamie Heaslip’s day. I’m not sure I can name three opposition tries in total over the years he was negatively involved in, yet here he had a hand in all of Montpellier's 5-pointers. For the run by Martin, he drifted across leaving the inside channel cruelly exposed and that was that - the centre was over the line from about 40m out. So now the home side had their tails up, even if their breakthrough did come about with a bit of luck. Not long afterwards, a kick for touch from Sexton is sliced (again most likely down to his leg) and from the resulting lineout in our own half, Heaslip decides to jump alongside his opponent and in his eagerness to thwart the resulting maul, grabs on way too early and was rightly pinged. Again...I saw no need to challenge from my admittedly-idealist perch. Now we had another lineout only in a more attacking position - not long after it, Nadolo goes over for try number two in the opposite corner. Added to the frustration of the one shortly before it, it’s easy to pull your hair out over this one. The lineout was taken, and there was a maul, only this time they weren’t going for the maximum yardage from it like they had before. Instead they chose to mix it up by quickly shipping it wide. For me it seemed a bit too simple to fault our actual tackling, although as Luke Fitzgerald pointed out in the Sky commentary box, “going low” on a beast like Nadolo in a one-on-one won’t normally work out well for you. Credit should also go to the Montpellier fullback Michel for delaying his final pass until just the right moment. We were just a shade behind with our readiness for a situation I really don’t believe we should have been in to begin with. Wherever the fault should have gone, we were 14-3 down in what seemed like the blink of an eye and I have to say I feared our heads dropping at that point. And as we emerged from the break without both Sexton and O’Brien, with all due respect to their replacements Joey Carbery and Jordi Murphy, it was actually my own head dropping this time...a little more when Steyn slotted an early penalty to make it 17-3. But that’s not what was happening with the lads out on the pitch. From the kickoff in that second half they were continuing to play, and the home side needed every bit of their power and physicality to keep us at bay. What we needed was a breakthrough of some sort, and more than the penalty Isa pegged back to make it 17-6 with half an hour left. Unfortunately one was to come but it was to go the other way. First we have the yellow card for Rob Kearney. It won’t surprise you much that I disagreed with the call...on first look it did seem like he was in trouble yet from the alternative angles it was clear that Rob stood his ground after the kick forward and Michel ran into him. But it seems the ref only looked at the big screen when it showed that original angle not the others and thus ruled it a yellow. Maybe the TMO could have brought the other perspectives to his attention? Anyway a man down we were, and really “under the kosh”. The penalty was kicked into the corner and a try looked inevitable...as it turned out one came from their visit to that end of the ground but certainly not in the expected fashion. This time we chose to actually trust our defence off the maul and we were brilliant at it, forcing a turnover scrum 5m from our line. I had been worried about this setpiece but this was the only one on our own put in where we had problems but even here we emerged with the ball courtesy of Jamie Heaslip. Pity about what happened next, though. Was it an error from Jamie or just a sensational read from Nadolo? I’m ruling about 70/30 in Nadolo’s favour. How often do you see that happen? This particular guy has a knack of making tries out of nothing and he can do it multiple different ways - clearly this is one of them. So the conversion went over and the scoreline of 22-6 looked ominous. 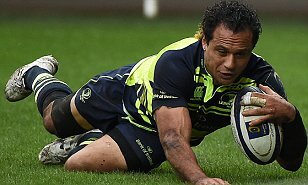 Not even the most optimistic fan of Leinster would have ruled out a fourth try for the home side. Thankfully for us, the lads out on the pitch weren’t buying into the doom and gloom, though Steyn being the 3rd best out half in the match (knockons, passes to ground, couple of missed placekicks and two penalties not finding touch) didn’t hurt us either. But our path to an unlikely losing bonus point wasn’t all about the Montpellier number 10, nor was it all about the Top 14 outfit being knackered in the closing stages despite their having to make about twice as many tackles as we did. What made our late reward a deserved one was an overall sense of belief throughout the team, plus an extra pair of fresh legs in the pack thanks to the prior planning, and last but certainly not least individual displays from the likes of Garry Ringrose, Dan Leavy, Sean Cronin and ultimately Jamison Gibson-Park, very much a catalyst for our offence when he came on, shipping a perfect miss-pass to his captain Nacewa who not only went over but had the presence of mind to make his own conversion easier thus bringing us within six. Sorry if you feel I’m ignoring any negatives on our part for this match; I’m not saying we had none on our side of things by a long stretch - I mean, we did lose, after all and that’s never good. It’s just with the weekend that was in it I think we displayed plenty of positives, we didn’t stop plugging away until the fat lady sang and we got ourselves not only a precious point, but one that has us sitting atop the pool going into round three. Next up for us in this competition is Northampton in the December “back-to-back” series...they suffered a big defeat in Castres but one thing we can expect from them is physicality very similar to that shown by Montpellier and if that’s the case, we’ll have to do better especially given the first encounter is at Franklin’s Gardens. A different kind of challenge for us next Saturday as we replay last May’s Pro12 final without our Ireland contingent (which I reckon will include a Mr G Ringrose).